Base map dated May, 1962. Item is a map annotated to show the boundaries of Project no. 2 areas 8 and 9. Area 8 corresponds roughly to the area bounded by Scotia Street, Brunswick Street, 2nd Avenue, and 8th Avenue. Area 9 corresponds roughly to the area bounded by Guelph Street, Fraser Street, 5th Avenue, and 7th Avenue. Base map is a reproduction of an aerial photograph showing the area bounded by Main Street, Clark Drive, Terminal Avenue, and Broadway. Base map: File number 3562-B, Plan number 12. 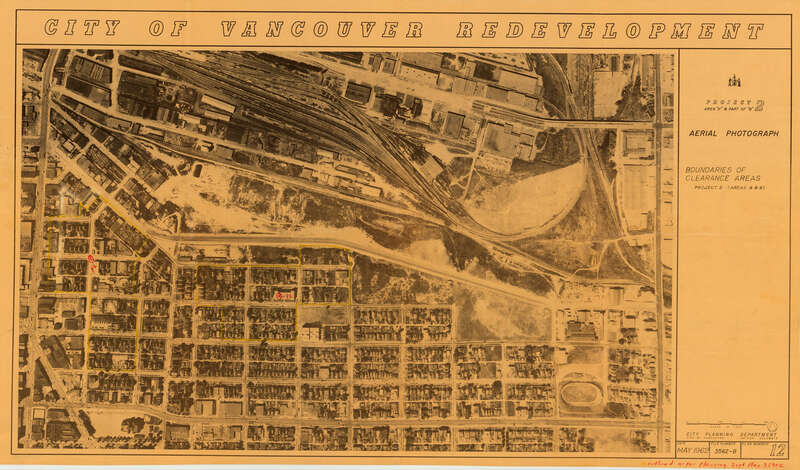 Copyright: City of Vancouver; expiry: 2039-01-01.